New instances are constantly being spun up in AWS, others are being closed down, keeping track of it all can easily become a full time job! 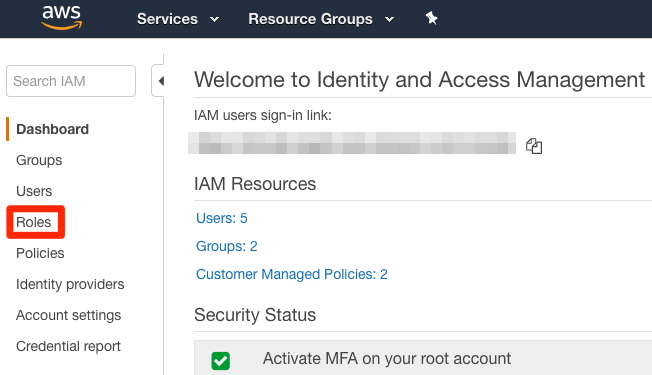 You can connect your Intruder Account by creating an IAM role for Intruder (AWS AssumeRole functionality) or by adding a new IAM user and entering the access keys. Copy the Account ID and External ID to a text document (or leave the Intruder portal open in a separate browser tab). 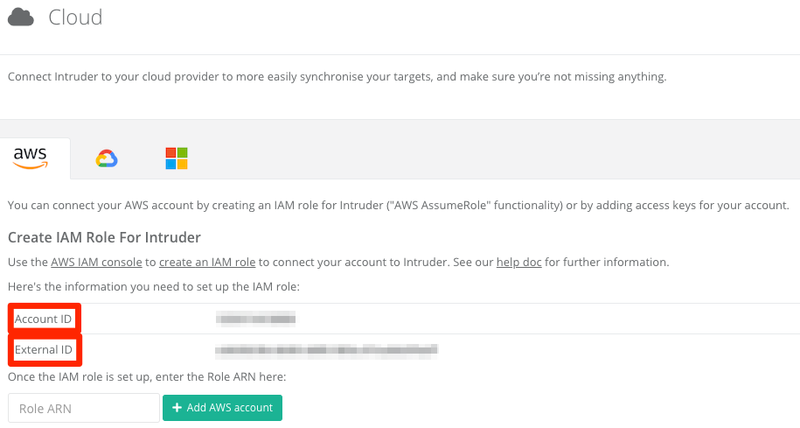 Now go back to the AWS - Create role screen, select 'Another AWS account' and enter Intruder's Account ID. Tick the checkbox to 'Require external ID' and enter the value you copied from our portal into the field. Finally, ensure the 'Require MFA' checkbox is not ticked and click 'Next: Permissions'. Click on 'Next: Tags'. On the next page you can add tags to the role but that is optional. Once you're done, click 'Next: Review'. 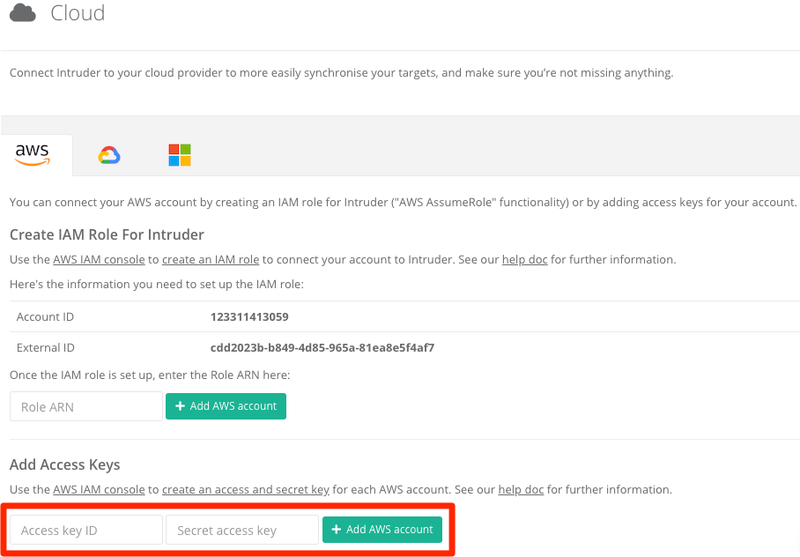 If you are connecting Intruder to your AWS account via access keys, we recommend creating a new user in your AWS account. When creating a new user, please ensure that Programmatic access is checked. Accounts with the 'AdministratorAccess' policy could also be used, but we would advise against this. 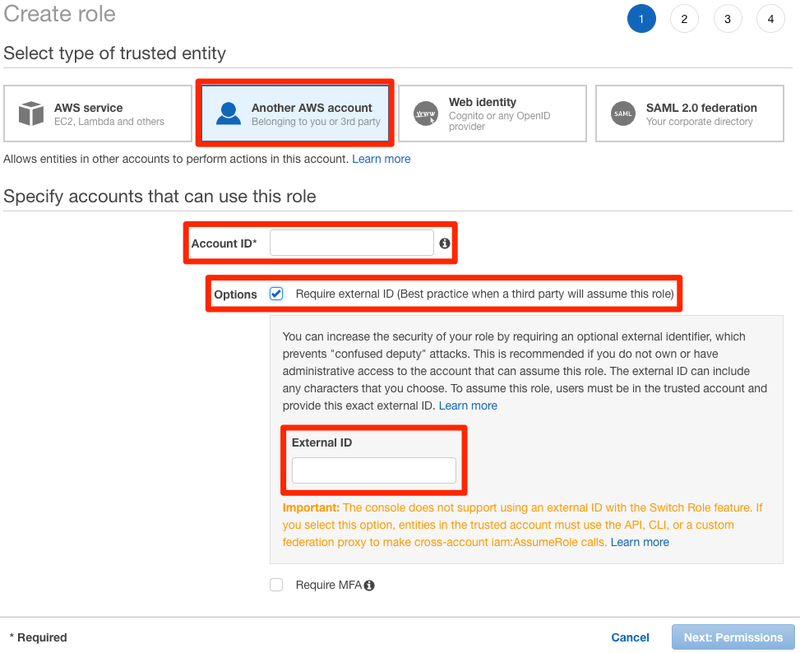 If you have multiple AWS accounts, the process above can be repeated to add each account you want to protect. 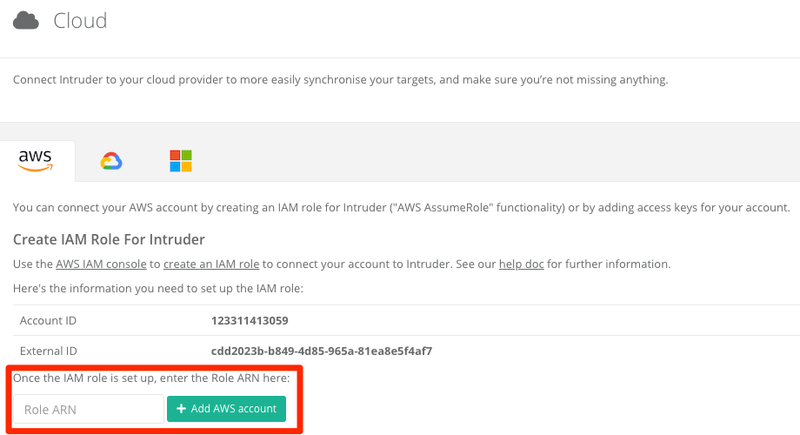 Once you've clicked to add your AWS account, you'll see a popup asking whether to activate CloudBot. 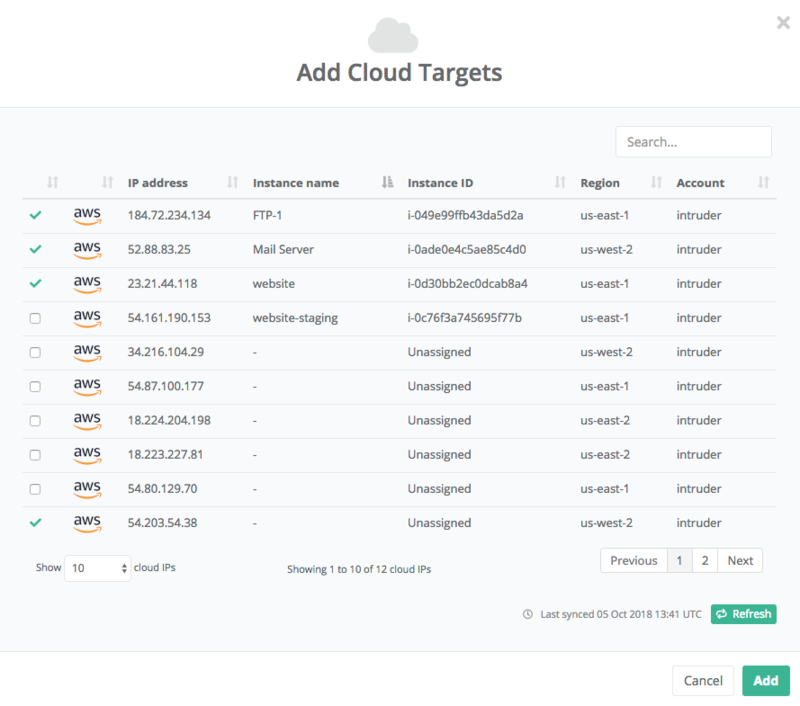 CloudBot keeps a constant watch on your AWS account and will automatically add any new external IP addresses or hostnames as Intruder targets. For more information see the CloudBot help page. To add them for continuous monitoring, simply select the IP addresses or hostnames you want as targets and click add. 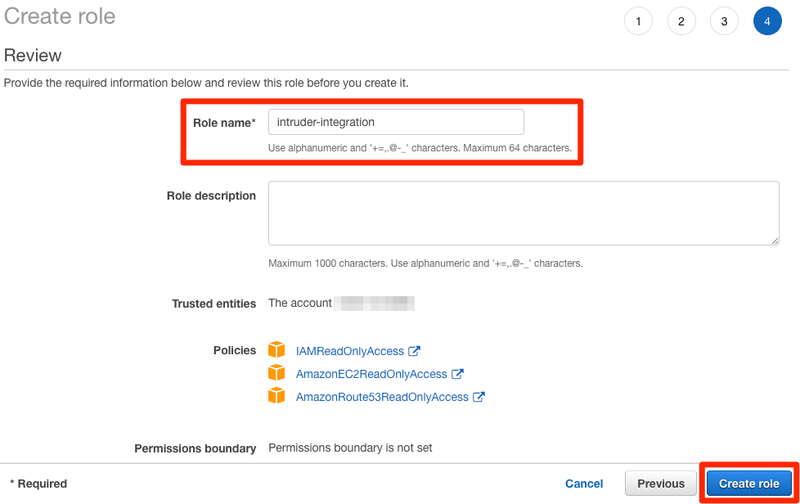 Note: AWS integration is only available for customers on our Pro and Verified plans.